Vea esta página en Español. Can you imagine a world where your LGBTQ+ family members are free to live their truth and our society celebrates them? Together we can create this world. Do you have someone in your family who’s gender and/or sexuality are diverse? Do you worry about the well-being of your LGBTQ+ child and want to know what else you can do to advocate for the LGBTQ+ community? Do you want to meet other families in similar situations and create a support network? Are you LGBTQ+ and Latinx and think that your family would benefit from this gathering? 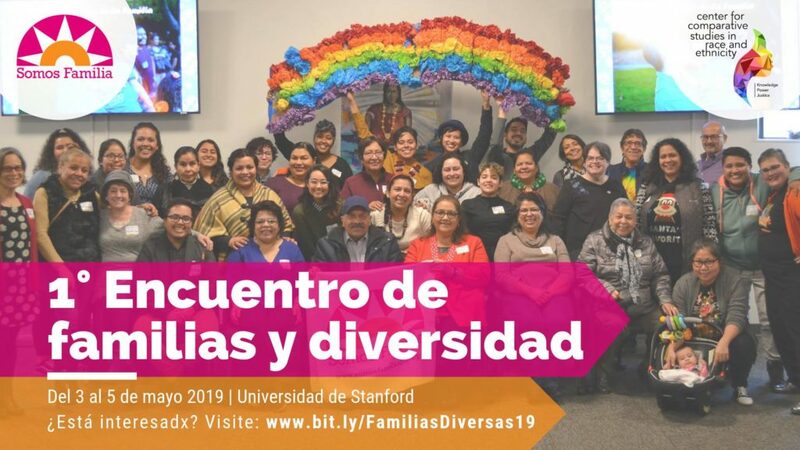 If you answered YES to any of these questions, we would love for you to join us for the FIRST STATEWIDE GATHERING OF DIVERSE FAMILIES at Stanford University on MAY 3-5, 2019. It will be a weekend full of community, dialogue and training. We believe that Latinx families have the power to be fierce advocates for the LGBTQ+ community and we want to share our resources in order to create a safer future. Would you like to attend? Fill out this interest form and we will be in contact with you. Help us create a supportive space for LGBTQ+ Latinxs and their families. Become a sponsor! !